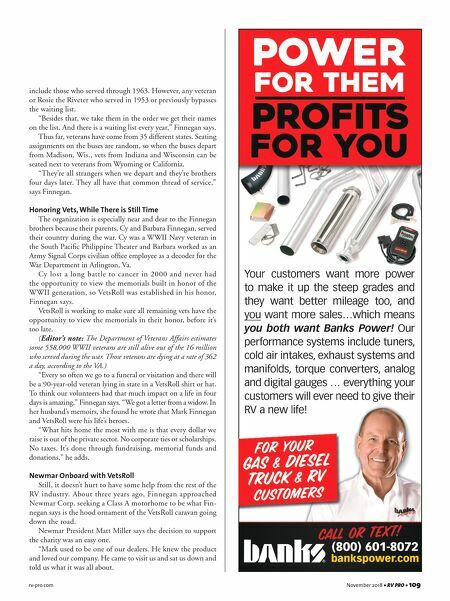 108 • RV PRO • November 2018 rv-pro.com B U S I N E S S Growing in Scope & Size Nearly 10 years later, VetsRoll is going stronger than ever. "We've taken almost 2,000 vets and Rosie the Riveters," Finnegan says. "We joke that the first year it looked like the Clampett's going down the road with all those RVs. We would stop at Burger King, Hardees, Motel 6. Now we are able to take them to five-star Marriotts, Hiltons and convention centers for meals. We have the Air Force cater us and the Marine Corps comes out. They (WWII vets and riveters) are treated like kings and queens." 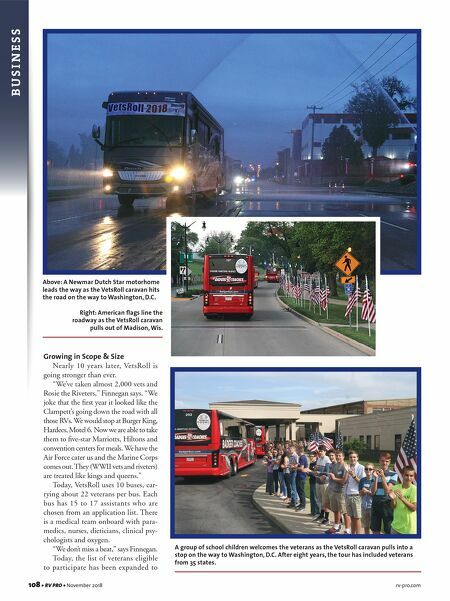 Today, VetsRoll uses 10 buses, car- rying about 22 veterans per bus. Each bus has 15 to 17 assistants who are chosen from an application list. There is a medical team onboard with para- medics, nurses, dieticians, clinical psy- chologists and oxygen. "We don't miss a beat," says Finnegan. Today, the list of veterans eligible to participate has been expanded to Above: A Newmar Dutch Star motorhome leads the way as the VetsRoll caravan hits the road on the way to Washington, D.C. Right: American flags line the roadway as the VetsRoll caravan pulls out of Madison, Wis. A group of school children welcomes the veterans as the VetsRoll caravan pulls into a stop on the way to Washington, D.C. After eight years, the tour has included veterans from 35 states.